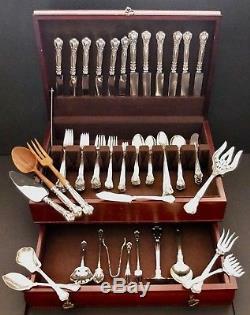 On offer we have an antique, or vintage, sterling silver set by Gorham in the popular Chantilly pattern. 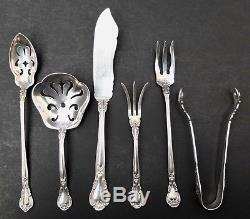 All pieces have the old 1895 - 1950 lion, anchor Gorham marks, except 2 servers with post 1950 "Gorham Sterling". Many of the pieces are monogrammed "L". 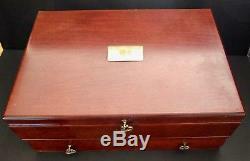 This 102 piece set comes in it's original wooden chest with drawer. 6 Dinner Forks 7 1/2" long with "L mono. 6 Luncheon Forks 7 long, no monogram. 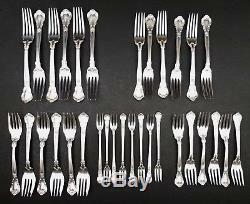 6 Salad or Dessert Forks 6 1/2 long, no monogram. 6 Small Salad or Dessert Forks 5 3/4" long with "L mono. 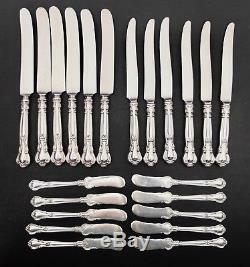 8 Seafood/Cocktail Forks 5 1/2 long, no monogram. 6 Dinner Forks 9 1/2 long, no monogram. 6 Luncheon Knives 8 7/8 long, no monogram. 10 Flat Handle Butter Spreaders 5 7/8" long with "L mono. 14 Teaspoons 5 3/4" long, 6 with "L mono, 8 with no monogram. 6 Cream Soup Spoons 6 1/4" long, 3 with "L mono, 3 with no mono. 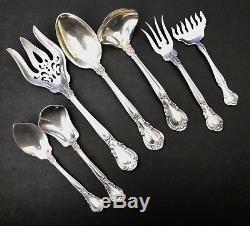 12 Iced Tea Spoons 7 1/2" long, 6 with "L monogram, 6 with no mono. 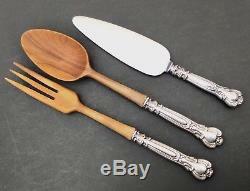 Wooden Bowl 2-Piece Set Salad Servers, 11 long, no mono. Pie Server With Stainless Blade 9 3/8 long, no mono. Jelly Spoon 6 1/8" long with "L mono. Sugar Shell Spoon 6" long with "L mono. Large Pierced Serving Fork 8 7/8 long with no mono, but has post 1950 mark. Large Serving Spoon 8 3/8 long, no mono, but has post 1950 mark. Gravy Ladle 7" long with "L mono. Chipped Beef Fork 6 3/4" long with "L mono. 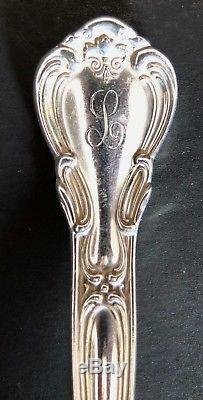 Sardine Fork 5 1/4 long with elegant 3 initial monogram I cannot read. Long Handle Pierced Olive Spoon 6" long with "L mono. Pierced Bon Bon Server/Spoon 4 3/4" long with "L mono. Master Butter Spreader With Flat Handle 6 3/4" long with "L mono. Lemon Fork 4 3/8" long with "L mono. Long Handle Pickle Fork 5 5/8" long with "L mono. 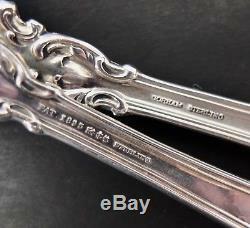 Small Sugar Tongs With Claws 4 1/8 long. Walnut Chest with drawer, lined in Pacific cloth, measuring 17" X 12" X 6 1/2. The silver, not including the pieces with wood or stainless blades weighs 6 pounds 3 ounces on my kitchen scale. The chest weighs 9 pounds. Together, this set is 16 pounds 13 ounces. We believe this set is in excellent condition for it's age and use. There are a few light scratches and one teaspoon has a dimple. The silver is in it's original condition. You may want tp polish some after decades of storage. The silver chest has some scratches and wear on the brass plate. Please view my photographs for more description. This belongs to my friend who collects everything. This set belonged to her great grandmother. The item "Gorham Chantilly Sterling Silver 102 Pc. Set 6 Place Settings & Servers In Chest" is in sale since Saturday, August 11, 2018. This item is in the category "Antiques\Silver\Sterling Silver (. The seller is "oz5477" and is located in Summerland, California.